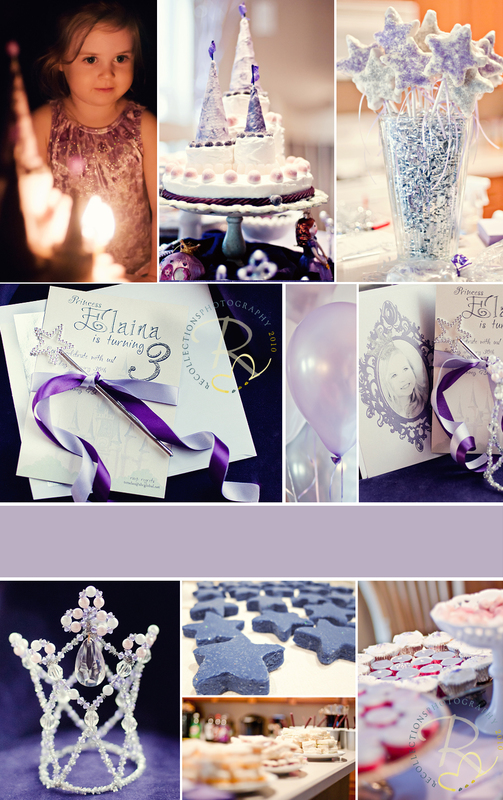 Recollections Photography - Newborn Child Family Photographer Frisco/McKinney TX: Purple Princess Party...~ Elaina Beth Turns 3! 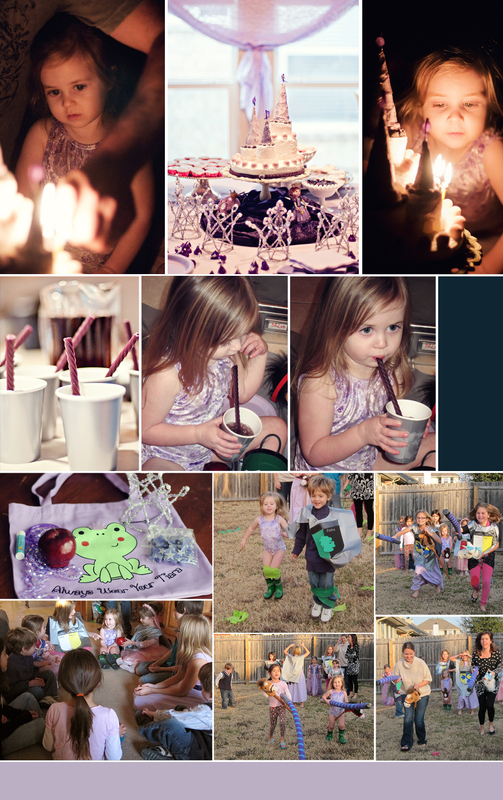 Purple Princess Party...~ Elaina Beth Turns 3! My beautiful spunky little girl had a fabulous party on Sunday. We had been talking about this party for months and she was so excited when she finally figured out that her birthday had arrived (it wasn't until I told her she could put on her "I'm the birthday girl" shirt for church). After church, while I was finishing the cake and cupcakes and getting everything put together, she walked up, grabbed my leg, looked up at me and said, "Thank you for making my princess party mommy." It just melted my heart and made my week. The time crunch I was feeling at this point was totally worth it! I am not a baker, but I was really pleased with how the castle cake turned out. I used tin cans from tomato sauce, tomato paste, and a large can of corn to bake the towers. Rice crispy treat wands made a pretty centerpiece and were perfect for sending home for favors. Marshmallow fluff sandwiches (grape jelly and marshmallow cream) and cucumber sandwiches. The hunt for all food purple was quite successful. I found grape Mike and Ikes, dark chocolate hershey kisses in purple wrappers, gummy hearts, gumdrops, and even grape licorice. Blue corn chips and queso were made a nice snack for the adults at the party. As pretty as everything turned out it was the games that were the big hit. We made coat of arms to put on tunics, and wore them for knight practice. Pool noodles made great lances! I had planned to have princess practice balancing books and learning to bow and curtsy, but being a knight was much more fun. We also had little mermaid races using green crepe paper streamers. Between games the kids played in a castle full of bubbles (pop up castle tent with a bubble machine by one of the doors). For the last two games we moved inside. We played pass the poison apple and each child got to pick their own small apple after they were out and freeze dance finished off the games. All the kids were so much fun to watch and I am so thankful that God blessed us with such a beautiful day, since we have missed the last three days of school due to snow and ice. I found the favor bags in the dollar section at Target months ago. The necklace, ring, and bracelet came together in a package all for $1, too. And the chapstick came from the dollar section a few months later, three for a dollar. The tiara was just pipe cleaner and beads. Glitter play dough stars were easy and so cute. Elaina and Elyssa both helped me cut them out. The boys didn't get the jewelry or tiara, but I ordered some cute crowns from Oriental Trading that even the girls loved. 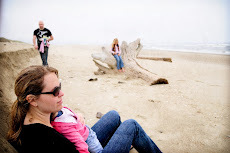 You will notice that my princess is showing her Lainy B personality. Although I wish she had left on the gorgeous dress that my mom made for her, I have to admit that her purple leotard and frog rain boots make me smile! where did u get the in invitations? I put them together myself. Email me at tori@recollections-photography.com for more information.